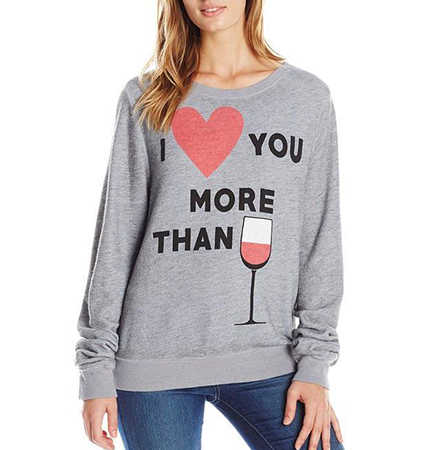 This is a whimsical women’s sweatshirt that feature a love-themed logo that extols the wearer’s praises for a special person over a glass of wine. It is constructed with traditional sweatshirt styling. The round neckline is double reinforced to prevent its ever stretching out of shape. Knit ribbing appears at the hemline and at the ends of both cuffs. The shirt is thick, soft and washable in warm water. It may be tumbled dry on a low temperature setting. The shirt is available for purchase in sizes Small, Medium and Large.